Black, green or herbal -- what is tea? We all have our favourite. But what exactly is the difference between these types of tea. And are they really tea at all? Black tea is a product of the leaves and buds of the Camellia Sinensis plant, known commonly as tea. During the processing of black tea, the leaves are allowed to ferment, causing the dark colour, rich flavour and relatively high caffeine content. Green tea is also a product of the Camellia Sinensis plant. But the leaves are processed and dried in such a way as to make sure that no fermentation occurs. The result is a light, crisp, clear low-caffeine hot beverage. Herbal tea, on the other hand, isn't a tea at all. So-called herbal teas don't come from the tea plant. Delicious though they are, herbal teas are actually infusions from a range of different colourful, flavourful and aromatic plants. So, to be completely accurate, it's best to refer to black or green tea as "tea." But if your tastes run to a hot herbal beverage, best to call it an "infusion" or, if you want to be terribly posh use the ancient word and call it a "tisane." But in our view, whatever you call it, whether black, green or herbal, there's nothing better than a nice cup of tea. We all think of tea as being the quintessentially British drink. And it's true, sort of. But the truth is that the British aren't actually the world's biggest tea drinkers. Britain actually comes second in the world for enjoyment of tea. So who is first? The answer may surprise you. Fact is, according to recent surveys, the world's most enthusiastic tea drinkers are the people of Turkey! The average Turk enjoys 74 ounces of tea per year, putting the country at the top of the tea drinking league tables. But the tea loving Britons aren't far behind, scoring an impressive 71 ounces per person, a two-way second place tie with tea-loving Iranians. Ireland, Morocco, Egypt, New Zealand, Poland, Japan, the Netherlands and (in another tie) Australia complete the top ten. China produces more tea than any country in the world (hence the famous phrase "for all the tea in China") but the Chinese only come in 15th on the tea-drinking scoreboard. And who comes in at the bottom of the tables. Well, sad to say but the average Belgian or Italian brews up a mere three-and-a-half ounces of tea per year. Which is a shame. So come on Belgium! Come on Italy! Put the kettle on! Did you know that there are now nearly 50,000 teapots for sale on eBay? 47,528 teapots at last count, to be exact. And all types. Large and small. Metal or ceramic. Simple or ornate. It just shows that while the vast majority of us now brew our tea in a mug or cup, the old-fashioned pot still holds a very special place in the tea lover's heart. It's always been this way. Throughout history the tea pot has been a combination of home appliance and style icon. While most of us don't really care about the design of our blender or dishwasher or cutting board, our tea pot is different. For many of us, a tea pot is a reflection of our personal lifestyle and fashion sense. The first known tea pots were actually modified wine jugs or copper kettles. The oldest surviving tea pot is from China and dates from 1513. It's kept in a museum and, probably because it's so old and valuable and whatnot, it's not often used for a brew up. By the 17th century, tea pots were more common. In those days, tea was shipped in glazed porcelain pots which helped protect the valuable tea from the ravages of salt and sea water. But, on arrival, rather than tossing out the pot, people started using them to brew the beverage. Before long, the tea pot was the most popular way to brew up a hot drink. But the tea pots were very expensive as they all had to be shipped from China. Another 50 years passed before the British figured out how to make porcelain tea pots. Once they did, the price started to drop. But while the pots were now made in Britain, for many years they copied the traditional Chinese designs. And even today, many modern teapots reflect the look and feel of the early Chinese designers. These days, teapots come in all shapes and sizes. One of our personal favourites is the Sorapot which you can see here (http://www.thegreenhead.com/2008/09/sorapot-modern-teapot.php). It not only makes a delicious brew, but looks great, too. So what about you? Do you have a favourite tea pot? A special pot that, somehow, makes your tea taste that little bit better? If so, we'd love to hear about it. Grab your digi-camera, snap a pic and send it along. We'll look at them all and publish the best entries in a future blog post. 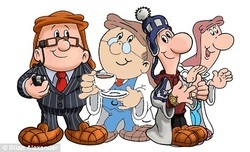 And, as an added bonus, everyone selected to appear on the blog will receive an extra-large packet of our finest Tetley tea just for taking part. Click here to send us your pics. We, like you, love a good cup of tea. It's a simple, straightforward, bevvy that soothes and refreshes and warms without a whole lot of fuss and bother. Every now and then, it's kind of fun to get all posh and fancy with our tea. Every now and then, it's kind of fun to host a swanky old fashioned, traditional tea party. It's not difficult. Here's what to do. First of all, carefully select your guest list. Somewhere between four and eight is an ideal number. Fewer than four makes things a little uncomfortable. And more than eight is a crowd, not a party. Choose your guests carefully. You'll want a mix of people who are close enough in age, interests and lifestyle to get along with each other, but not so similar that the conversation becomes dull and routine. Put a bit of effort into your invitations. E-mail is, as we all know, quick, convenient and free. But it lacks that special something. Better to spend a few pennies and a little effort on a nice, hand-written card or letter. It'll make all the difference. Choose your tea as carefully as you choose your guests. Tea should be of a good quality and flavour, but not so terribly expensive as to make your guests feel uncomfortable. Try to offer two or three choices. Plus a green tea. And make sure to have a one or two herbal offerings for those who prefer to avoid caffeine. Once you've chosen your guests and selected your tea, have a look at your tableware. We all love a good hearty mug of tea, but does that sort of thing really set the mood for a tea party? Probably not. So why not invest in a couple of delicate tea pots and a few nice cups and saucers. They don't cost much and, once you see how much fun a tea party can be, you'll have plenty of opportunity to use them again and again. Finally, there's the small matter of food. There are all sorts of things served at a tea party. But in the interest of keeping things simple and fun, we have but one recommendation -- cucumber sandwiches. Nothing, in our experience, says tea party like a tray of crisp yummy cucumber sandwiches. And fortunately, they're super easy to make. Take a few slices of plain white bread and chop off the crusts. Toss a stick of butter into a bowl. Throw in a bunch of fresh mint and mix the whole lot together. Spread the mixture over the bread slices. Grab a cucumber and slice it as thinly as you can. Layer the cuke slices on the bread and sprinkle with a wee bit of sugar and a tiny pinch of salt. Lay them out on a swanky looking tray with a dash of garnish and don't be surprised if your guests look at what you've done and think you must have spent all day slaving in the kitchen. So there you have it. Good company. Great tea. Nice food. A simple recipe for a wonderful tea party. And if you do, why not tell us about it? Take a few pics or maybe even a video of your next tea party and send it along. We'll post the nicest, funniest, cutest, prettiest and most interesting on a future blog post for all the world to see and enjoy. And, if you get your tea party on the blog, we'll send you a huge packet of our finest tea as a thank you just for taking part. Stand-up comic Billy Connolly once said "never trust a man who, left alone with a tea cosy, doesn't try it on." Here at Tetley, we couldn't agree more. In fact, some of us, when we're alone and think no one is looking, have been known to make a hat out of a cosy. And we're not alone. There's actually a Facebook group (http://www.facebook.com/group.php?gid=86700280007) devoted to people who have "at least once in your life have tried a tea cosy on your head." There's just something so wonderfully hat-like about a tea cosy that most of us just can't resist popping it on our head. Have you ever worn a tea cosy? Ever wanted to? Well now is your chance to enjoy international fame by becoming an official Tetley "cosy model." Simply pop your favourite tea cosy on your head, snap a pic and send it along. We'll post the most attractive, funniest, weirdest and wackiest here on the blog for tea lovers across the globe to enjoy. For every 100 cups of tea enjoyed around the world, more than 95 are made using tea bags. Tea bags are so commonplace that the small amount of tea now sold out of bags has to be specifically called "loose tea." But it wasn't always this way. For most of history tea was sold loose. It was only a hundred years ago that that the tea bag was invented. And it took even longer for the bag to become the norm. Which, when you think about it, is a bit strange. Because if ever there was a match made in heaven, it is tea and the tea bag. Well, as every tea lover knows, to taste its best, the tea needs to be taken out of the water once it has brewed. Left to sit in the water for too long, tea turns bitter and becomes stewed. In the early days, people used all sorts of methods and techniques to get their tea out of the water at the right time for maximum flavour. Tea balls, small perforated metal containers, were a feature of every kitchen. As were fine-mesh strainers. Some people actually put their tea in eggshells! It was all very messy and complicated. But, for a long time, there was no convenient alternative. It took an American named Thomas Sullivan to invent the tea bag. But unlike most inventors who spend years and years working on their breakthrough, Sullivan came up with his invention completely by accident. Because Thomas Sullivan wasn't actually an inventor. He was a tea merchant. Round about the early 1900s, Sullivan decided to drum up a little business by sending out samples of his product in little sacks made of silk. Unexpectedly, his customers assumed that the tea was supposed to be used in the sacks. And because of that, completely by accident, the tea bag was born. Of course, being a sharp fella, Thomas Sullivan quickly cottoned on to his discovery and set about improving it. He swapped silk for gauze because it infused much better. He came up with the idea of attaching a small string to the bag so it could be easily removed from the pot. And attaching a small label to the string so tea lovers could see what they were drinking. People loved it. The tea bag was an instant hit in the USA. But over the ocean, it took a while longer to catch on. Tetley introduced tea bags to the UK market in 1953 but, a full decade later, they only accounted for 3 percent of the market. But while the bag wasn't an overnight success in Britain, it did gradually gain favour. By 1980 half of all tea sold was in bags. Ten years later, that figure was 76 percent. And today, bagged tea makes up 96 percent of all tea sold in the UK. And to think it all started with a few free samples! For most of us, a cup of tea is a tasty hot beverage. A relaxing break from the stresses of the day. Perhaps an early morning pick-me-up. Or a sociable drink shared amongst friends. But for many years, tea wasn't seen as a beverage at all. In fact, for a very long time most people thought of tea as ... medicine! The first known tea drinker was a fellow called Shennong who, when he wasn't drinking tea, spent most his time at his day job as Emperor of China. Legend says that Shennong discovered tea when he was sitting outside enjoying a cup of hot water. A few tea leaves happened to blow into his cup and, surprised by the pleasant taste and immediate feeling of good health, he continued to drink it ever after. We're not sure how accurate this legend is, but it is certainly true that in cultures around the world, tea was first seen as an aid to good health. In Japan, tea was introduced by priests who brought it back from their expeditions to China. But, again, it was used as a medical remedy. In fact, the oldest known book about tea, written by one such priest was called How To Stay Healthy by Drinking Tea. Well before the arrival of the British, tea was grown in India for use in traditional medicine. In the west, tea was introduced to Britain by the British East India Company in the middle of the 1600s. But it was sold to customers as a sort of all-purpose health tonic and it wasn't until the turn of the century that tea turned from a medicine to a beverage. The same thing happened in most parts of the world. Tea was introduced as a health drink, then later became a popular hot bevvy. But nowadays the clock seems to be turning back. Tea seems to be returning to its beginning as a health drink. More and more, we see stories in the papers about scientific research associating tea with good health. In recent studies, tea has been linked with increased alertness, better mental health, weight loss, reduction of cholesterol, anti-aging and much more. Once again, the message seems to be that tea is good for you. Much of this research is inconclusive and we're certainly not suggesting tea as an answer to all that ails you. But isn't nice to think that your favourite drink might actually be doing your body some good. Everyone wants to see into the future. But what if you don't have a crystal ball? What if you can't read Tarot cards? What if you tossed out your Ouija board back in the eighties? Well don't give up. All is not lost. If you want to see what the future holds you need nothing more elaborate than a cup of tea! Fact is, people all over the world use tea leaves to see into the future. It's called "Tasseology" from the French word "Tasse" meaning "cup" and "ology" meaning "you can't be serious!" Okay, it doesn't. Of course you can't really predict the future. But you can have loads of fun pretending. Start by brewing a cup of your favourite tea. Use loose tea, rather than a tea bag. If you don't have any loose tea, just tear open a tea bag and toss that in. Pour the tea into a white cup so it's easy to read. Next step is to drain off the liquid. Some practioners suggest that you pour the liquid away but we feel this is a waste of a perfectly good cup of tea. Better to drink it instead. Now ask your subject to concentrate on a question that he or she wants answered. As your subject does this, pick up the cup with your left hand and swirl the leaves three times in a clockwise direction while covering the cup with your right hand. Now uncover the cup, peer inside and examine the leaves. Look for shapes and clusters of leaves. These are the key to predicting the future. Divining meaning and reading the future from these shapes and clusters is a fine art known to insiders as -- faking it! Come on! They're tea leaves. They don't actually tell the future. But don't let that stop you. Just make it up as you go along. Chances are you know a little about the person whose "future" you're reading. And chances are, with a bit of imagination, you can make some of the "shapes" mean something. For example, if your subject has some holiday coming up and you can find a few leaves that look sort of like an airplane, then it won't be too hard to look all mystical and announce that "I see in your future a journey to a far off land." Or let's say winter is coming and you can find a few leaves on the outer edge of the cup, then try something like "I see cold winds coming from the North." You get the idea. Just fake it. It's harmless. It's a bit of fun. And if nothing else, you'll get a nice cup of tea out of it. We've all heard the advice from medical professionals to keep our bodies hydrated. Drink eight glasses a day, they tell us. But how boring is that? It's water! It's as dull as ... well, water! And it tastes like nothing. But now there's some good news. You don't need to drink bland old water. You can have a nice hot, tasty cup of tea instead. Fact is, scientific studies show that a cup of tea has the same hydrating effects as a glass of water. What's more, tea is loaded with anti-oxidants, those weird little chemicals that fight off bad stuff and help keep us healthy. Oh, but what about caffeine, you ask? For years people have claimed that caffeine is some sort of terrible thing that makes you expel more water than you take in. Rubbish. Modern research shows that caffeine isn't anywhere near the water killer that some people thought. In massive quantities, caffeine isn't all that great. But the quantities have to be massive. Crazy massive, in fact. But in moderate amounts, caffeine isn't a dehydrant. As for tea, the amount of tea in a cup doesn't even come close to massive. The average cup of tea has very little caffeine in it. In reality, if you tried to make a cup of tea with too much caffeine, it would be so strong and yukky tasting that no one would want to drink it. Well, first of all, if you enjoy a glass of water now and again, then keep drinking. It won't hurt you and it might actually do you some good. But don't feel obliged to down eight glasses a day. And if you enjoy the warm, tasty, hearty taste of a great cup of tea, then keep drinking that. It, too, may do you some good. Water and tea. Together, they'll keep you well hydrated. Nearly 5,000 years ago the Emperor of China encouraged his people to drink tea as a cure for everything from tiredness to tumours. He wasn't exactly right. Much as we love it, even we wouldn't suggest that tea is an all-purpose cure-all. But while the ancient Emperor may have oversold the benefits of tea, he wasn't completely wrong. Fact is, medical study after medical study has found a close connection between tea drinking and overall good health. Which means that if you're genuinely ill, you're much better off visiting a hospital than a tea room. But if you're looking for a tasty, satisfying drink that might be rather good for you, then tea certainly fits the bill. For one thing, tea is packed full of the sort of good healthy stuff your body craves. Just four cups a day delivers 17% of your recommended daily allowance of calcium. The same four cups provide 22% of your required vitamin B2. And 5% of your zinc. And it doesn't end there. If a bright smile and healthy gnashers are important to you, it's good to know that tea is a natural source of fluoride. Plus, just like fresh fruit and veggies, tea is loaded with antioxidants, which help remove bad stuff like pollution and chemicals from your body. And, just like fresh water, tea keeps your body hydrated throughout the day. Pretty good for a drink that costs pennies a cup, contains no calories whatsoever and is 100% fat-free! It takes three full years before a tea plant is ready for harvesting. It takes somewhere between four and ten years before a tea plant produces seeds. If not trimmed, a tree plant can grow to be up to 50 feet high. No matter how tall the tree plant, only the top two or three inches are plucked to make a tea beverage. These top bits are called "flushes." Flushes can be plucked every week or two during the growing season. Tea has almost no carbs or fat. Some medical studies have found that tea drinkers retained more brain power than non drinkers. In most of the world, tea is enjoyed as a hot drink. But the USA is different. In America, 80% of tea is consumed cold, called ice tea. The most popular additives to tea are milk (popular in the western world) and lemon (more popular in Asia and Russia). Butter is often added to tea in parts of Tibet while in certain parts of Pakistan, salt is a popular addition to a cup of tea. Next to water, tea is the most popular drink in the world.